MOSCOW, Russia -- The speaker of Russia’s lower house of parliament has said Ukraine would last “a maximum of four days” in open conflict with Russia, state news agency RIA Novosti has reported. 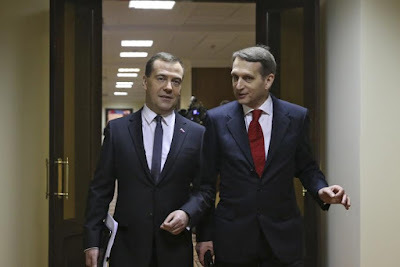 Russia's Prime Minister Dmitry Medvedev (L) and Speaker of the State Duma Sergei Naryshkin walk to the lower house of parliament in Moscow, April 22, 2014. Naryshkin made a controversial comparison between the Baltic states and dogs at a parliamentary seminar on Wednesday. 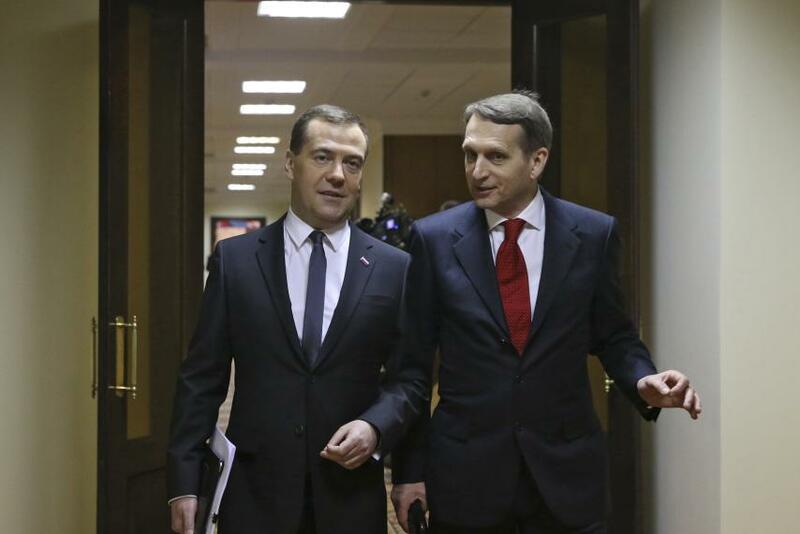 Sergey Naryshkin, speaker of the Duma and leading member of Russian President Vladimir Putin’s United Russia party, spoke to Russian lawmakers and visiting German political experts at a seminar in Moscow on Wednesday—and shared some controversial opinions. Speaking about Ukraine's struggle against pro-Russian rebels in its eastern regions, Naryshkin said the mere fact the conflict has lasted two years shows Russia is not involved. “If for any reason Russia needed to begin military operations and reflect the aggression of a country comparable by its capabilities to Ukraine, I trust we all understand how many days the conflict would last,” Naryshkin said. “There is your answer to the question who the Kiev regime is fighting,” Naryshkin said, referring to persistent accusations from Ukraine and the West that Russia is running covert operations within its southern neighbor. Numerous captures of Russian soldiers in Eastern Ukraine and reports of an influx of both arms and troops across the eastern border have not changed Russia’s insistence that the fighters in the east are volunteers. In the same seminar, Naryshkin also compared the Baltic countries to angry dogs, trained to fear and growl at strangers, Russian independent news agency Interfax reported. Russia’s relationship with the Baltics since the annexation of Ukraine’s Crimean peninsula in 2014 have deteriorated rapidly. Lithuania, Latvia and Estonia have pushed for permanent NATO deployments on their territory since 2014, although this has not yet materialized. “Here we often see signs hung by the doors of houses in the countryside that read ‘Beware, Angry Dog,’” Naryshkin said. The event featured the apparent differences in how Russia and Europe view one another. Fear of a potential Russian attack has been particularly palpable in Moscow’s former Communist allies in Eastern Europe since the start of the Ukraine crisis. “Well, an angry dog isn’t born angry,” Naryshkin said, continuing his metaphor. “When it is young, it comes into the world good, and the anger is especially manufactured so that it will be vicious to those who approach its owner without his invitation,” Naryshkin said. “I imagine, in any case, that some of this fear on behalf of our Baltic neighbors is also taught and taught with a purpose,” Naryshkin added. He did not unveil what the purpose was, but Naryshkin has previously accused Western states of being “Russophobic” when they have not seen eye to eye on Russian foreign policy. He branded the Parliamentary Assembly of the Council of Europe “genetic Russophobes” in December 2015 after a decision to ban Russia from the group over its annexation of Crimea was upheld. Both Russia and NATO have reinforced assets in Eastern Europe since the annexation and both sides have said their measures are defensive. However, a recent analysis of both sides’ military exercises by London-based think-tank the European Leadership Network warned that the two sides are openly planning for war with one another and may inadvertently cause conflict. A NATO summit in Poland this summer will determine the alliance’s future strategy in maintaining the security of its Baltic and Eastern European members. It's hard to figure out which one of Naryshkin's comments are worthy of response, but one thing is clear: the man and his like-moinded associates are verifiably nuts. The whole comic "Novo Rossiya" project was cooked up in the Kremlin - not by their thugs in Eastern Ukraine. It was brought to an abrupt and early halt by mere untrained Ukrainian volunteers.....not unlike Washington's ragged and barefoot colonial "army" at Trenton. I suspect that the banners, flags, and brochures that were intended for distribution to cheering, liberated victims of Ukraine's "repressive junta" are now gathering dust in some FSB warehouse. The early success of Putin's thugs was halted by these volunteers and - had it not been for the introduction of Russian troops - they would be looking back at Ukraine's border from Rostov by now. But notwithstanding all of Naryshkin's self-delusional thoughts, there is no doubt that a full-scale assault on Ukraine would be a bloody mess - for both sides. Naryshkin's comments reflect the extent to which its leaders are deranged. With so many problems in the world - including the miserable condition of Russia's own population - all that this cretin can think about is Russophobia and Russian intervention in the affairs of other countries. I've never been accused of "russophilia", but even I think that the Russian people deserve better than these corrupt clowns.